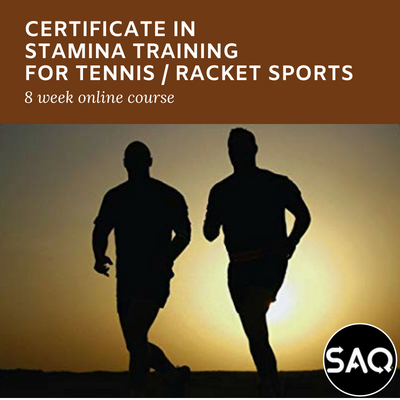 This module examines Stamina Training for Tennis & Racquet Sports and the importance of a multi-sprint stamina and strength endurance approach to the whole concept of endurance development of Tennis & Racquet Sports. The second certificate covers stamina or endurance training for your chosen sport. The reason we start with endurance development is simple. At the start of the training year, stamina is seen as the first component of fitness that is undertaken in a training programme. This course starts by looking at endurance development in general and then endurance as it applies to sport specific training for racquet sports. While the various games of racquet sports are not regarded as an “endurance sports”, we know that there is a need for endurance training of some dimension in order that players are conditioned to last a game of high intensity. 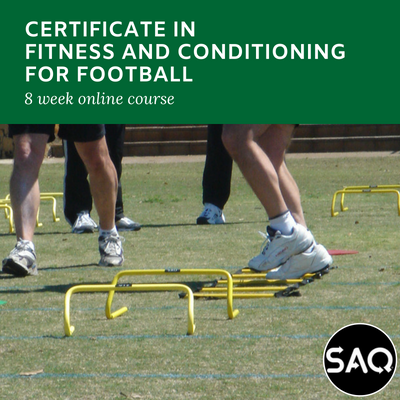 In order to understand the endurance requirement, the module looks at the physical fitness demands of the sport and tries to outline the best way to get players fit to meet these demands. In particular, we look at how fit a player needs to be to last a fast paced game. In other words we want to look at the type of specific fitness that is required in racquet sports. However if you are only a beginner coach, the course will still have plenty of important information and coaching tips for you. Having a National Racquet Sports Association Level 1 Coaching Award should help you and obviously those who have achieved a SAQ® Level 1 Award (PSM – Performance Sport Movement Award, FM – Fundamental Movement Award, or even the eDM – Early Developmental Movement Award) will also find that any of these courses will have provided you with an excellent background understanding of fitness training in general. In most sports, endurance training, if wrongly planned, can interfere with skill and speed development. By wrongly planned, we mean that a coach employs the wrong type of endurance training for the sports participants or introduces it at the wrong phase of a training session or over-emphasises it at the wrong phase of the annual programme. The wrong type of endurance is the endurance that has no relevance on the court. We are referring here to the slow endurance running of some year’s ago where the pace, the skill and movement activities of racquet sports were or are neglected. On the other hand, by having some endurance work in a training session at the wrong time can have a very negative effect on the overall success of an actual training session. So we will look at these two aspects of endurance training in regards to the specific racquet sports. This course aims to upgrade your knowledge on the theory and practice of endurance training in general and specifically as it applies to racquet sports. We will also offer some suggestions for training sessions which will help you understand the type of endurance sessions you can use with the players and team under your direction. Unfortunately most of our suggestions are without the use of the ball and this is a deliberate decision taken by us as we feel that the student or coach must understand the suggestions we are making and use them to design their own sports specific drills using the outlined theory. We may even illustrate a drill from another sport so that you can adjust to suit one’s own requirements. Finally we need to encourage all the coaches to look at the part of strength and stability has on field and court sports and on racquet sports in particular. Stability refers to the ability of the player to move about the field or court while in full control of limbs and body. It is the functional competence we need to develop to stabilise movement. We all know how important movement and the ability to move is in all field and court sports. Stability, as the foundation of strength development, makes an athlete or player more stable, agile and faster when moving around during play and leads them to be better at repeating movement and sports specific skill at the highest level possible throughout the duration of a game. If we think carefully about this last point we may realise more easily that this is the endurance players need to last a game of high intensity racquet sports.